Championship side Ngong FC are mourning the death of their immediate former player Brian Adira who passed away on Sunday Sep 16, 2018. Through an official statement shared by Kenya Rugby Union, Ngong say Adira passed away on Sunday after being rushed to hospital following a short illness. 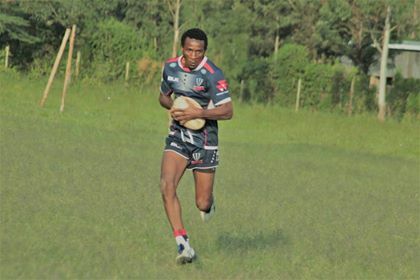 "Brian was an outstanding winger who played position 14 for Ngong Warriors for three successive seasons, two at the Nationwide league and one in the Championship. He was the top try scorer for the club and was awarded in the AGM and Dinner of the Club in 2017." He played his last game for the Club during the Prinsloo Sevens between 21st and 22nd July 2018.He was scheduled to play at the recently concluded Christies Sevens but he was not available due to work commitments. "His immediate family and the Ngong Warriors Rugby Club fraternity are still coming to terms with the loss. Burial arrangements are still underway involving the immediate family and friends and further communication will be issued regarding the same," concluded the statement. Ngong RFC secretary Thomas Murayi authored the statement.